SATURDAY DECEMBER 1 – LAST CHANCE FOR 2018! The Classic Santa Experience is an interactive time for the children and Santa to connect and a time for the children to experience the warmth of Santa.During this time, Santa Claus will share stories and engage the children while Rex captures heartwarming images of the experience. A one on one private visit with Santa Claus and Mrs. Claus in a totally live interactive experience. No lines, no distractions and no stress. 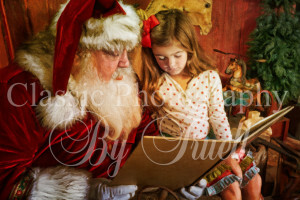 This isn’t a traditional photography session that has standard poses, but a live photo journalistic documentation of your child’s interaction with Santa Claus and Mrs. Claus. Santa will read a story, talk about his workshop, tell about toy making. The children share cookies and milk with Santa Claus and Mrs Claus and a whole lot more. While this is happening, we will capture every moment. It is so much more than just a photo shoot, it’s a true experience that the family will talk about for years to come.